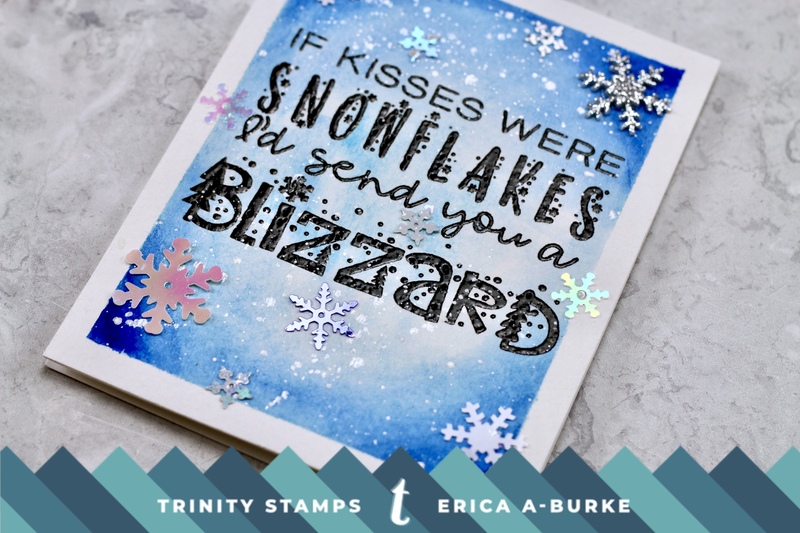 Hello everyone and welcome back to Trinity Stamps blog! 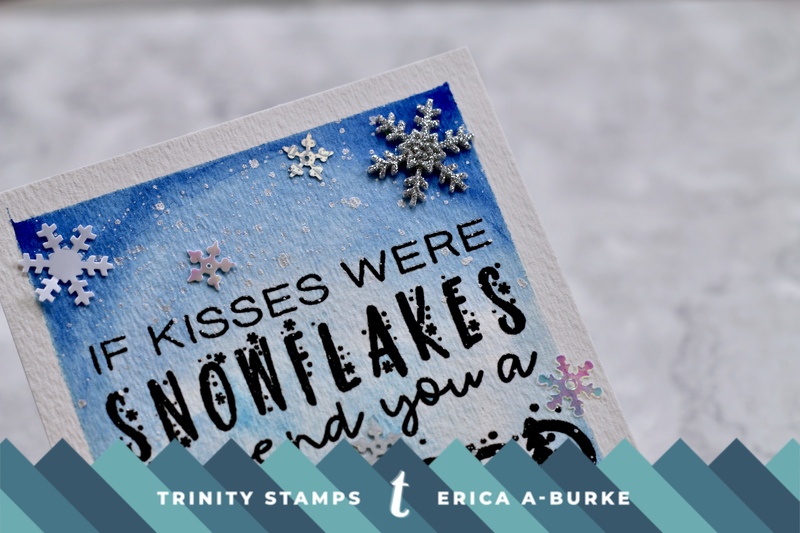 This week we have been showing off an exclusive stamp set, Snowflake Kisses. This set will not be available to purchase BUT if you spend $60 or more this weekend, you will get it free! How is that for a wonderful incentive to treat yourself to some fabulous goodies? Hopefully my card for today will be further incentive to get shopping this weekend! Let’s get to that, shall we? To start out with, I cut out an A2 (5.5″x4.25″) panel out of water colour card stock. This I taped down to a piece of cardboard with masking tape. Not right to the ends though, I left 1/4″ space around. This is a nice way to frame your image, without adding diecuts or other things. I grabbed my Daniel Smith water colours and settled on, surprise surprise, a blue shade or two. However, I’m getting ahead of myself here. Before I started painting my background, I stamped the sentiment in black and heat embossed it with clear embossing powder. This works a treat when you are going to water colour something. Starting in the middle, I added a light wash of blue and then gradually build up the layers, towards the edges. Patience isn’t my strongest point, so waiting for the layers to dry is torture. To speed the process up, I used my heat gun very gently before starting the next layer. Now, if you know me, you might know I’m a bit of a splatter kind-of-gal. I do like me some splatters for sure! With a wet paint brush, I got to work with White Gold from my Starry Colors palette. 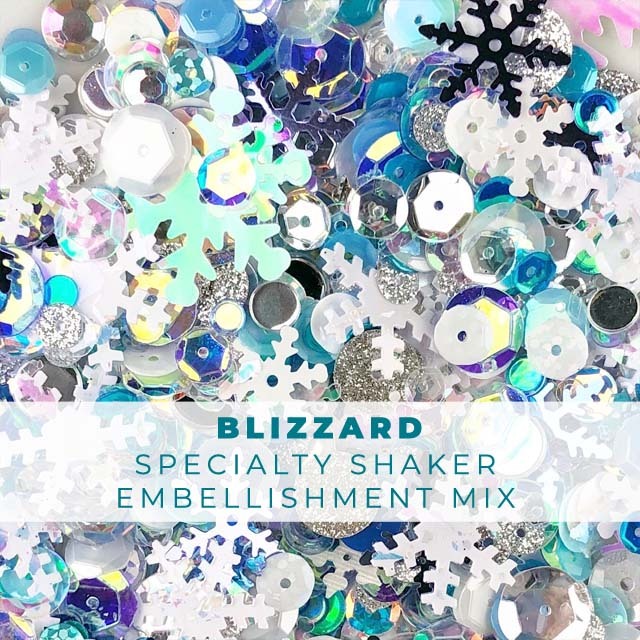 While that was drying I picked out some gorgeous snowflakes from the Blizzard embellishments mix. I do love snowflakes too so I picked out lots of them, in different sizes. These I added using Glossy Accents and then the card was done! 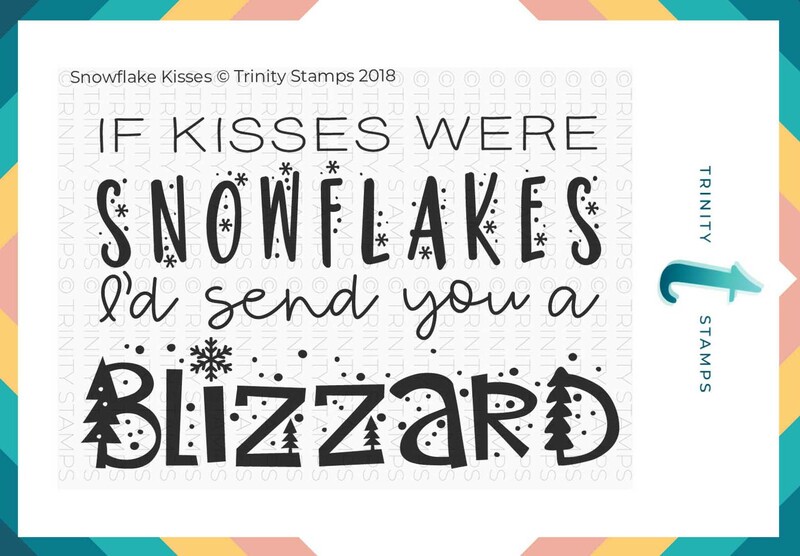 That’s it from me for today but don’t forget to check out the fabulous embellishment section in the Trinity Stamps shop. And don’t forget the stamps of course! 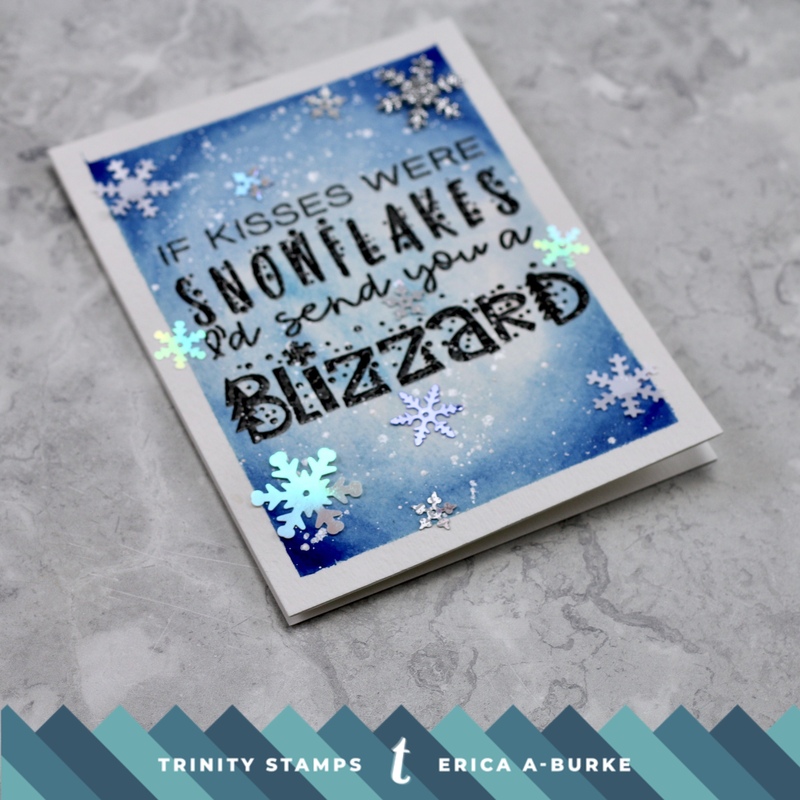 Winter Botanicals II: One Stamp, Three Ways with Designer Emily! 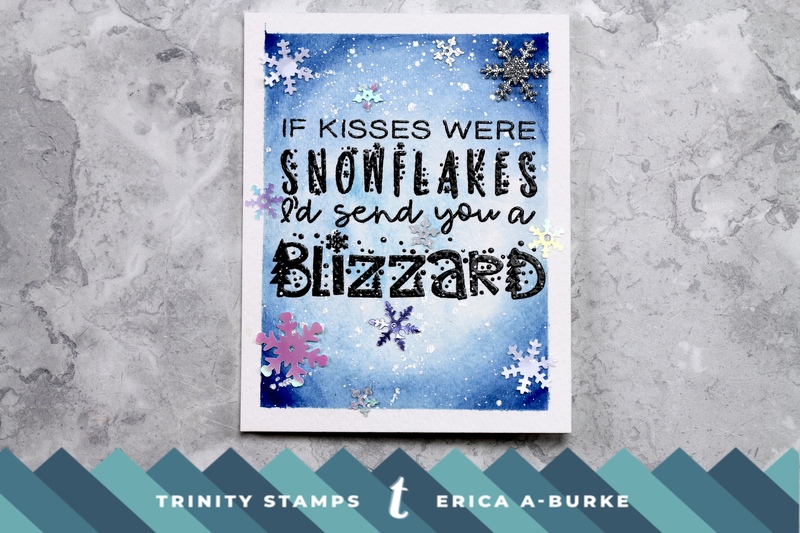 Snowflake Kisses All Shook Up!